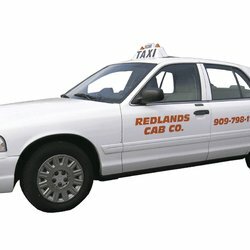 Redlands Taxi- Redlands Cab Company the premier taxi service in the area was established in 1976 and since then the family owned and operated business has been serving the Inland Empire. Offering discounts to senior citizens, students, the men and women of the military and customers with special needs. Redlands Taxi Company and their professional, friendly staff guarantees safe, reliable and dependable service. The professional and helpful customer service representatives are available to take your calls 24 hours a day. Whether you need a comfortable cab service to pick you up at the airport or just a short trip to local meeting or appointment Redlands Taxi Co. provides the best in customer care. Providing transportation to airports, casinos, Amtrak and Metro Link Stations, Redlands Taxi can get you to your destination on time. Call Redlands Taxi-Redlands Cab Company for your next stress free ride, 909 798-1111.